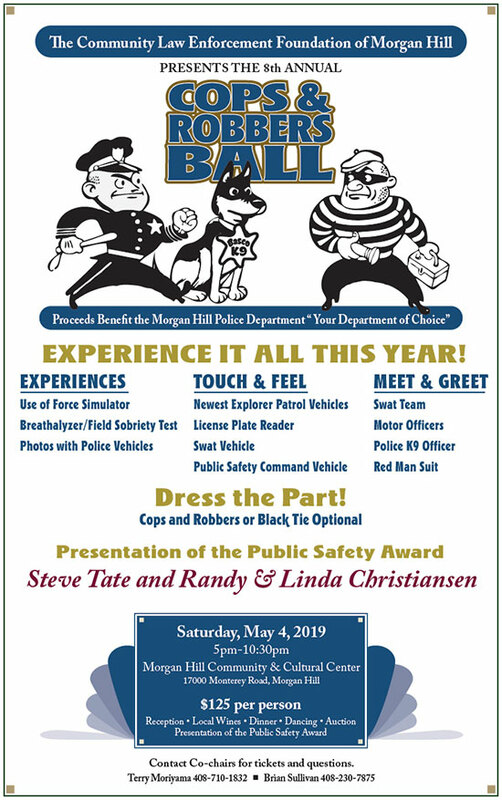 The eighth annual Cops & Robbers Ball, presented by the Community Law EnforcementFoundation will benefit the Morgan Hill Police Department. The event will feature a reception, dinner, presentation of the Public Safety Award, silent & live auctions and dancing. About the Foundation: The mission of The Community Law Enforcement Foundation (CLEF) is to support and promote public safety by building community partnerships. These partnerships provide financial resources that help the Foundation fund programs and purchases for the Morgan Hill Police Department, allowing them to work more safely and efficiently to better serve the community. It is the Foundation’s belief that public safety is the most important service that the city government provides its citizens and thereby provides this vehicle for the community to express its support for the police department. The Foundation is a sustaining organization that will operate for years to come. The Foundation works closely with the MHPD's administration to align our fundraising efforts with equipment and services not currently covered by the city budget. CLEF is a 501(c)3 non-profit, Tax ID 20-4774304.